Update: Daniel Humm, the Executive Chef at Campton Place at the time of the below review, has since left the restaurant in order to take over as Executive Chef at Eleven Madison Park in New York. Peter Rudolph is now in charge of Campton Place's kitchen, but I have not had an opportunity to visit the restaurant since Rudolph took the helm. You can read my assessment of Rudolph's cuisine at his prior position, as Chef de Cuisine at Navio, here. Campton Place restaurant and its executive chef, Daniel Humm, have each achieved some truly remarkable feats over the past several years. The restaurant started the year 2000 holding an unimpressive 2.5-star rating from The San Francisco Chronicle, and the chef at the time seemed to be struggling with a formula to get things back on course. 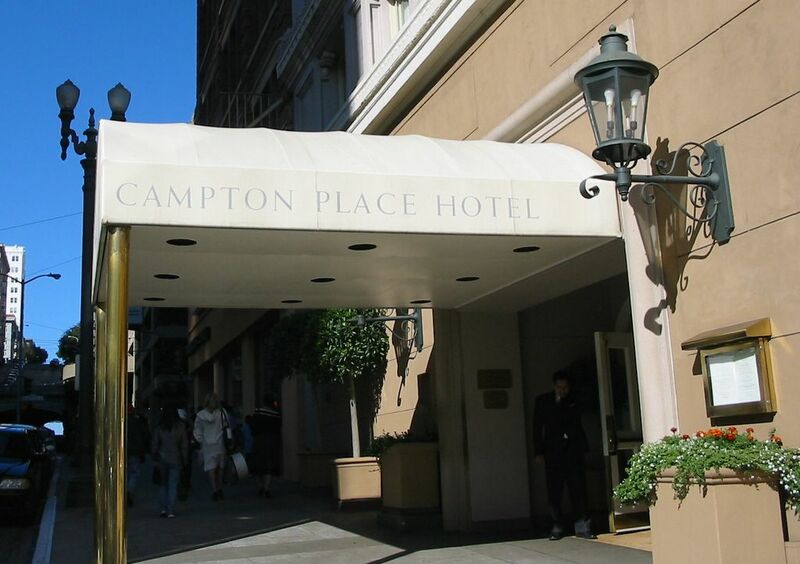 As the years went on, however, Campton Place did precisely that – earning steadily increasing accolades with each new review, and marching up The Chronicle's ratings scale in 0.5-star increments. The culmination of this occurred just last month, when The Chronicle identified Campton Place as one of the Bay Area's seven 4-star restaurants. Daniel Humm took over the kitchen at Campton Place in early 2003, and four months later – at the ripe old age of 26 – he drew a 3.5-star rating from Michael Bauer at The Chronicle. Bauer described Humm as "a miracle worker" and a "shoo-in" for an eventual 4-star rating, and he positively gushed about Humm's talent and his menu. In the ensuing years, The Chronicle named Humm as a 2004 Rising Star Chef, The James Beard Foundation nominated him for Rising Star Chef of the Year in both 2004 and 2005, and Food & Wine Magazine named him one of its 10 Best New Chefs for 2005. And now, of course, Humm has joined the select group of Bay Area chefs who head up 4-star kitchens – a group that includes Thomas Keller, Ron Siegel, David Kinch, Hubert Keller, Roland Passot, and Alice Waters. I had been to Campton Place for dinner once in the pre-Humm era, and that experience – coupled with other lackluster reports from around that same time period – had left me rather ambivalent about returning. But the blaze of glowing reviews that Humm and Campton Place have earned could not be ignored, and so it was that I recently joined some friends for dinner at the restaurant. metallic champagne bucket has been placed. In front of the bucket is a small billfold that contains a description – and the per glass price – of each of the selections, placed vertically so that diners can easily read the information. Although the wooden champagne cart at The Dining Room at the Ritz-Carlton is probably a bit more elegant than the one at Campton Place, any restaurant that has a champagne cart gets extra points in my book! I also appreciated the prominently displayed written description of the champagnes and their prices, which is something that most other restaurants do not offer. The menu is divided into five sections, namely Appetizers, Soups, Aquatic Flavors, Fish and Crustaceans, and Meat and Poultry. Diners can design their own 3- or 4-course menus, or they can opt for a 7-course Chef's Tasting Menu or a 12-course Chef's Tasting Menu. 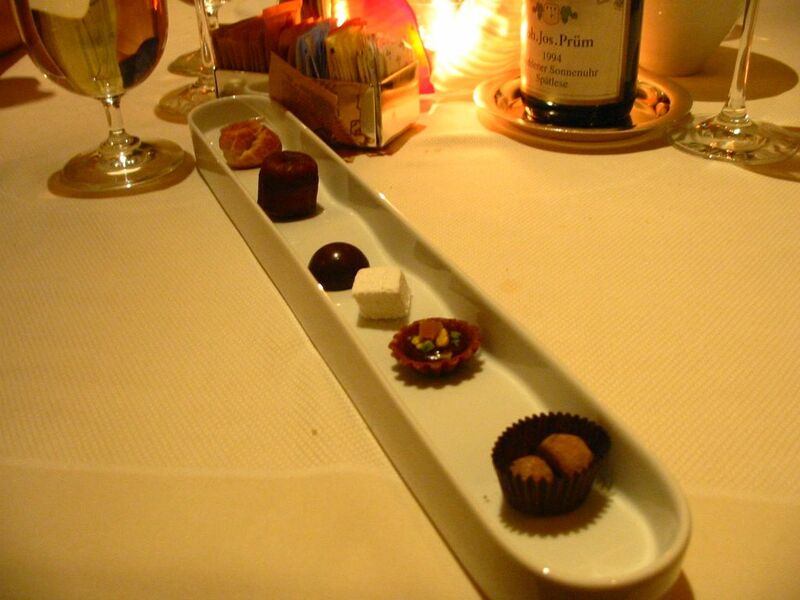 The tasting menus, if desired, must be ordered by the entire table. After giving it some thought, my three dining companions and I settled on the 7-course Chef's Tasting Menu. As described below, however, the actual number of dishes delivered to our table was far greater. Shortly after placing our orders, we were presented with a long narrow dish containing a variety of amuse bouche selections (Taste: 6.5 / Presentation: 8.0) (Ratings Explained). I will not endeavor to describe each of these bite size creations individually, but suffice it to say that they were, on balance, good but not spectacular. 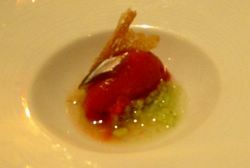 Next up was another amuse bouche, Sorbet of Heirloom Tomatoes with Pickled Cucumbers and Marinated Anchovy (T:8.0 / P:8.5). The cool but soft sorbet carried the wonderful, concentrated essence of tomato – sweet with just the slightest amount of acidity. Meanwhile, the tiny and perfectly-uniform dice of pickled cucumbers underneath provided a surprisingly big flavor, one that cut right through the sorbet and provided an excellent contrast. The marinated anchovy provided nice texture, but it did not in my view contribute anything special to the overall flavor of the dish. For the first full course, my half of the table received the Cauliflower Cream with Royal Sterling Osetra Caviar and Sea Urchin Foam (T:6.5 / P:8.5). This dish was visually quite appealing, with a nice presentation of the cauliflower cream and caviar set down before us and then topped tableside with a perfect dome of frothy sea urchin foam. In terms of taste, however, the dish did not fare quite as well. The sea urchin foam was fine, but it had a mild flavor that did not seem to engage much with anything else on the plate. Meanwhile, the cauliflower flavor in the cream was seemingly non-existent; it was either washed away by something else on the plate, or it was not sufficiently there in the first place. Only the caviar really shined, enough so that the overall dish was still quite good. The other half of the table received the Sea Urchin Sabayon with Osetra Caviar, Sea Urchin and Clam Gratinee (T:8.0 / P:8.5). 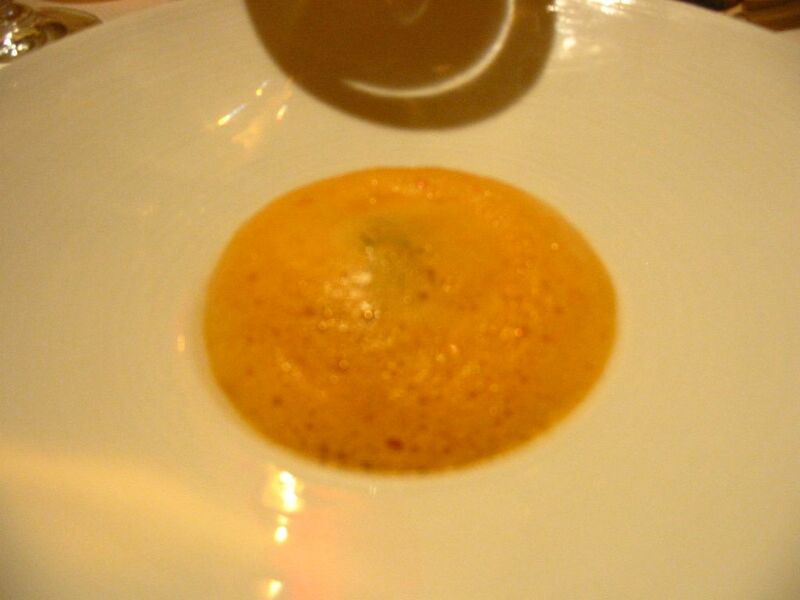 A smooth, creamy custard with just a faint taste of sea urchin was punctuated with the same outstanding caviar as on my dish, while the clam gratinee served on the side was given a delicious twist by the unexpected presence of lavendar. Next up was a sashimi dish – Trio of Hawaiian "Poisson Cru" with Kona Kompachi, Big Eye Tuna and Nairagi Toro (T:9:5 / P:8.0). The quality of the fish here was outstanding, with clean distinctive flavors and soft buttery textures. The organic soy sauce and the salt-lime dipping sauce that were served on the side were each outstanding in their own right, but together they reached astonishing heights. This was a spectacular dish – delicious and elegant in its relative simplicity. The third course consisted of two separate variations on the combination of watermelon and tomato. 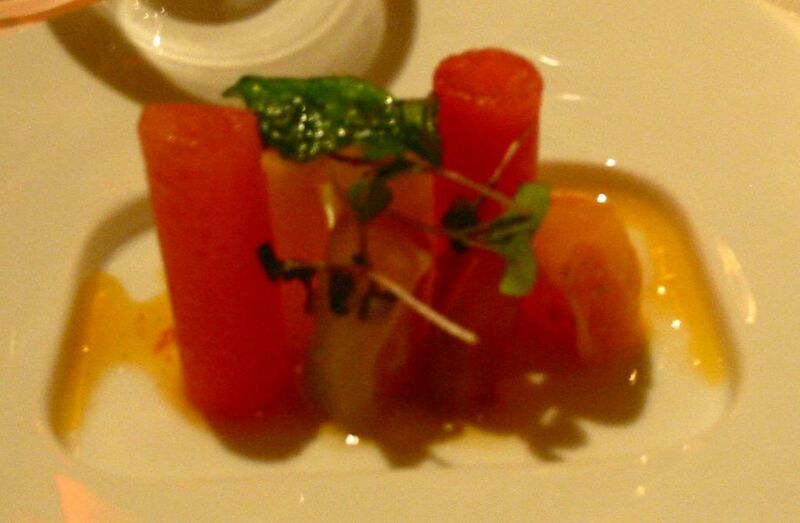 I received Watermelon and Heirloom Tomato in an Almond Vinaigrette (T:8.0 / P:9.5), a dish comprised of several small "cylinders" of tomato or watermelon, each of different height and each stood on its end. The presentation here was beautiful, and the taste was fresh, light, very flavorful and summery. The herbs placed on top of the dish added a nice accent. 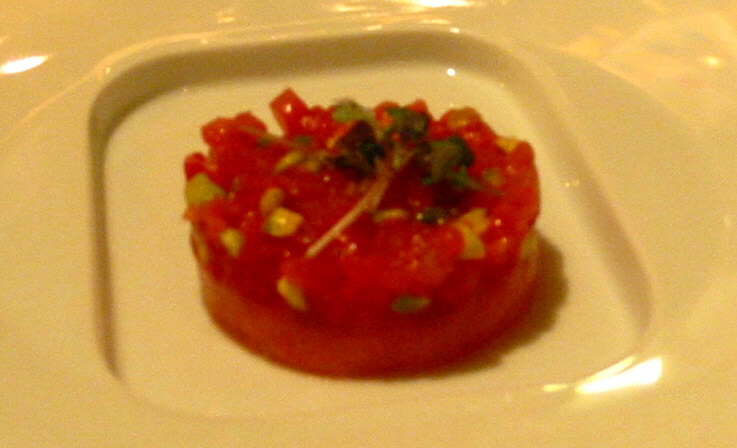 The other half of the table received a Watermelon and Tomato Tartare (T:5.5 / P:7.0). This dish, though certainly interesting, had a very unusual flavor – probably due to the balsamic vinegar and pistachio that were used to flavor it. While the kitchen deserves high marks here for pushing some boundaries, this clearly was among the weaker selections of the evening. 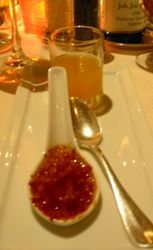 All four of us received the same thing for the next course, the Artisan Foie Gras Crème Brulee with Melon Consomme (T:8.5 / P:8.5). The smooth, creamy richness of the foie gras "custard" found the perfect foil in the crunchy burnt sugar topping, while the melon consommé on the side served as an excellent palate cleanser. I was not particularly optimistic about this dish at the outset, both because I generally prefer my foie gras in seared form and because my first exposure to foie gras crème brulee - at Philadelphia's Le Bec Fin - was a very disappointing one. But Humm definitely won me over. The fifth course was one of the best of the night, Aiguilette of John Dory "Sous Vide" with Saffron Fumet and Tomatoes (T:10.0 / P:10.0). 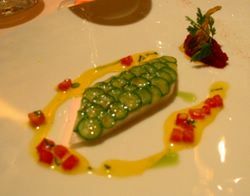 A fillet of nicely cooked fish was topped with thin coins of delicious zucchini, arranged in such a way as to resemble the scales of a fish. An incredibly flavorful and creamy saffron sauce was then drizzled around the perimeter, with a small quenelle of tomato confit sitting off to one side. The flavors and textures here came together spectacularly, the saffron from the sauce creating perfect harmony with the delicate fish and tender zucchini. Meanwhile, the tomato confit on the side was simply amazing; indeed, I don't know if I have ever tasted such concentrated and intense tomato flavor, as if an entire crate of tomatoes had been carefully reduced down to a single tablespoon. An equally stunning presentation earns this dish a perfect 10 on both fronts. I prepared myself for the likelihood that the next course would not live up to the last, but it turned out that I was wrong. 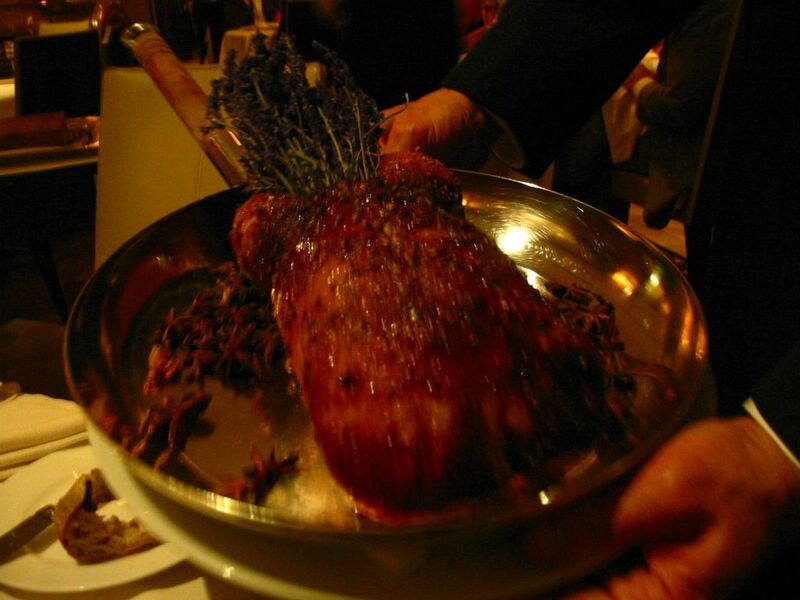 The Glazed Barberie Duck with Lavendar Honey and Spices (T:10 / P:10) was just as spectacular, with moist tender meat and crispy skin in a rich brown sauce that helped to amplify and deepen the flavors. It was the lavendar honey, however, that was arguably the key ingredient here, contributing a wonderful floral undertone that give the dish that extra special something. The visual appeal of the dish was also impressive, with the whole duck brought before us and then carved and plated tableside. Another perfect 10 for both taste and presentation. The cheese course came next, and the entire table was served a Fresh Andante Dairy Goat Cheese (T:7.0 / P:8.0). A small piece of soft tangy cheese was sprinkled with dry herbs and fleur de sel, and then drizzled with olive oil. The result was very good, if somewhat unremarkable, but the odd thing was that the only bread made available was olive bread – despite the fact that other breads had been on the table throughout the entire meal. A perfectly fine dish overall, but I have certainly had better. 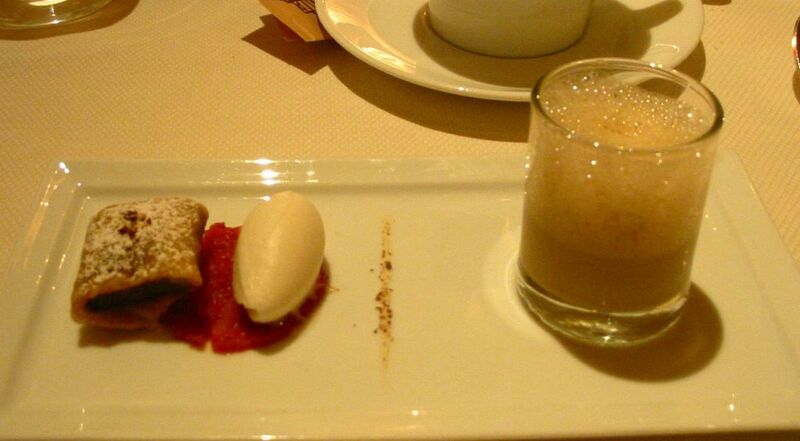 The Jasmine Orange Cappuccino (T:10 / P:10) arrived shortly after our cheese plates had been cleared, and this was by far the best palate cleanser that I have ever had anywhere. Cold, slushy, bright, floral, fresh, refreshing – I could have easily consumed a liter of this deliciously spectacular concoction and have still wanted more. What I found particularly interesting here was the way in which the brightness would at one moment seem to be coming from the citrus, and then the next moment appear to be contributed by the jasmine. 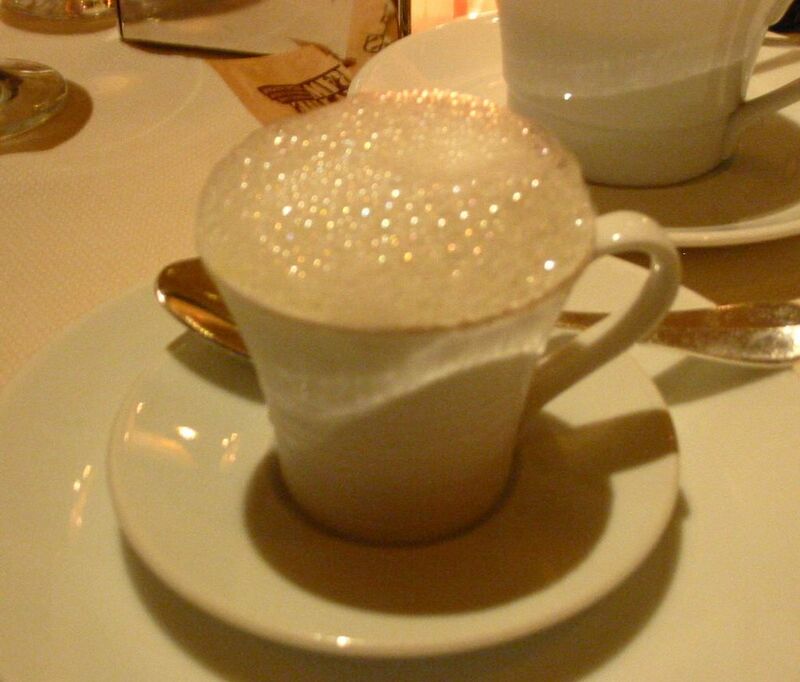 Served in a small cup and made to resemble a hot frothy cappuccino, this selection readily deserves a perfect 10 for both taste and presentation. The final full course of the evening was our dessert – a Valrhona Chocolate Pastilla with Orange Guajillo Confit and Chicory Milk (T:6.5 / P:7.5). The pastilla was basically just a thin deep-fried wrapper containing molten chocolate, and the first attempt to cut into it with a fork caused an explosion of chocolate to spread across the surface of the plate. The confit had both the sweet taste of orange and a slow burning heat from the guajillo peppers, and the frothy milk off to the side had the strong and unmistakable taste of chicory. The components of this dish were all fine, but nothing stood out as particularly noteworthy, and the combination of ingredients never really attained any synergy. 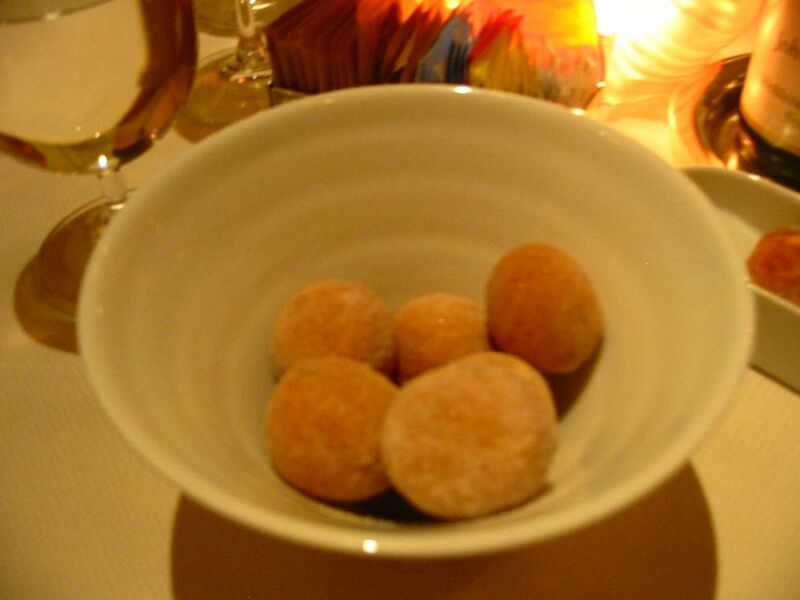 The meal closed with a bowl of soft sugary beignets, and another long and narrow plate – this time carrying the mignardise. Here again, all of the confections on the plate were very good, but nothing that one cannot find at other restaurants of this caliber. The one thing that really caught me by surprise at Campton Place was the service. It was, in a word, outstanding. So outstanding, in fact, that I can confidently say that it was just as good as any that I have encountered in the Bay Area during the past several years. Our server was the consummate professional – knowledgeable about the menu, attentive to everything happening at the table, and responsive to our requests. He kept a close eye on wine levels throughout the evening, refilling our glasses frequently enough to keep them from being empty, but not so often as to become an intrusion. 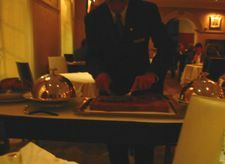 After presenting the duck to us and taking it over to the tableside carving board, he noticed me trying to take a picture of it from a bit of a distance. He promptly lifted the pan and brought the duck back over to me, simply so I would be able to take a close-up shot. And so it went the entire evening, his interactions with us becoming more involved when we were amenable and less so when we were engrossed in our own conversation. It takes a certain talent to be able to "read" the mood of a table, and our server pulled it off masterfully. The rest of the waitstaff were equally impressive. They replaced silverware seamlessly and unobtrusively, presented dishes to everybody at the table at the same time, and maintained consistency both in the direction from which plates were served and cleared and in the side from which wine and water glasses were refilled. My only minor criticism – and it's a personal pet peeve – is that the servers regularly brought courses to the table even when one of the diners had momentarily stepped away. I realize that it's a major inconvenience for both the kitchen and the servers to have to readjust the timing of everything the moment a diner leaves the table, and I know that it's much easier said than done. But a restaurant of this caliber ought to make the effort, and top-tier service – in my view, at least – demands it. Regrettably, I have seen only one restaurant in the Bay Area that consistently abides by this principle, and that is The French Laundry. There is one thing that sets the servers at Campton Place apart from those at other top-tier Bay Area restaurants, and that is the tableside service that they are expected to perform. Sure, the Campton Place waitstaff do their fair share of pouring soups, adding finishing sauces, or topping dishes with foams – just like their counterparts at other establishments. But they also go well beyond that, carving whole ducks out in the dining room, deconstructing and plating a whole branzino in salt crust before diners’ eyes, and even putting together a composed cheese course right out of the cheese cart. In each instance, the servers handled the necessary tasks with remarkable aplomb, proceeding confidently and gracefully through the motions and producing plated dishes that rival those of the most obsessive chef. There were other nice touches as well. For example, it's my usual practice at the end of a meal such as this to inquire whether I might be able to get a copy of the menu to take with me. Here, before I even asked, our waiter brought over a small piece of folded cardstock, inside of which was printed the entire tasting menu that we had just enjoyed. Moreover, the menu had been signed and dated by Chef Humm. As another example, Chef Humm himself walked through the dining room several times throughout the night, stopping at every table at least once to say hello. It's thoughtful gestures such as these that define a great restaurant. There is one final point about the service that I feel compelled to note, and that has to do with the time it took for our meal. As we sat at the restaurant enjoying our dinner, the pacing of the meal seemed perfect; not too fast, not too slow, and a relatively consistent interval between the delivery of courses to the table. And it certainly did not feel like the meal was dragging on in any way. Yet, I was surprised when I looked at my watch on the way out and realized that we had been there for four full hours. Now, it's true that our 7-course meal actually ended up being 9 to 12 courses, depending upon whether amuse bouche and other extras are counted. But four hours for a meal of this sort still seems somewhat high when compared to other establishments in this class, and I can only imagine how much longer we might have been there had we opted for the chef's 12-course tasting menu instead. While I personally did not mind the duration of the meal, the restaurant should perhaps consider tightening up the pace a bit to account for diners who may not wish to set aside the entire night for dinner. 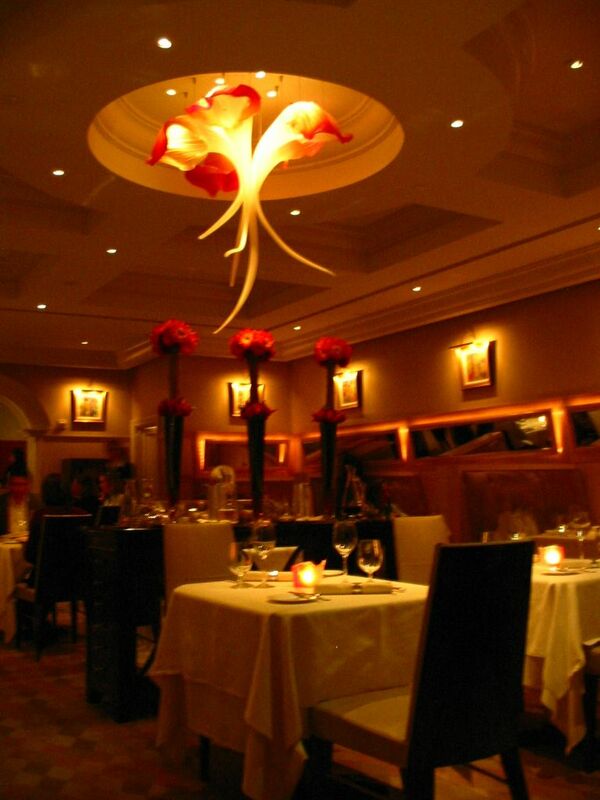 The décor and atmosphere at Campton Place are elegant refined, modern and understated. Tones of beige and brown are periodically interrupted by peach and red accents, while white tablecloths and modern furniture give the room a sleek look. A large hand-blown glass light fixture sits suspended from the ceiling in the middle of the room, its reddish tones and free flowing shape echoed in the small glass pieces that surround the candle on each table. The names on the tableware are all first-rate – Bernardaud, Christofle, Spieglau – and the fabrics in the room are warm and inviting. Overall, the feel is calm and tranquil – a marked departure from the hustle and bustle of Union Square that lies just outside the front door of the hotel in which the restaurant sits. There can be little question that Campton Place is one of the Bay Area's best restaurants, and the plaudits that Humm has earned for the establishment are clearly well-deserved. Humm's menu is well-grounded in the fundamentals to be sure, but it is equally marked by the pairing of disparate ingredients, the incorporation of modern techniques, and the exercise of great creativity. Indeed, there are only a few restaurants in the Bay Area that produce dishes so distinctive that one could immediately identify their source simply through sight and taste; Campton Place is one of them. It's true that some of the innovative combinations that Humm offers work better than others. Yet, I give him a lot of credit for not simply emulating the successful approaches of other chefs, and for instead seeking to blaze a path that is uniquely his own. And given that Humm is still only 28 years old, we will hopefully have the privilege of witnessing his ongoing evolution for many years to come. Brilliantly written review, NS. I love your ratings system and thoughtful commentary (can we persuade you to take over the reviewer job at the Chronicle?). One of these days, I'll definitely have to check out Campton Place. I haven't been there since Todd Humphries was the chef. I've met Humm and he seems like a decent, amiable guy, so it's nice to hear his food lives up to the hype for the most part. Brett: Thank you for the very kind words - it means a lot coming from a great writer such as you! I've never had the pleasure of having an extended conversation with Humm, but watching him move through the dining room left no doubt in my mind that he's a very personable and gracious guy. This is definitely one chef to watch, as I predict that we will see big things from him in the years to come.